killed and his men stampeded over the bluff. Many drowned, and their bodies washed ashore downstream in Washington. More than 700 Union troops were captured. This Union rout had severe political ramifications in Washington and led to the establishment of the Congressional Joint Committee on the Conduct of the War, which investigated the defeat. 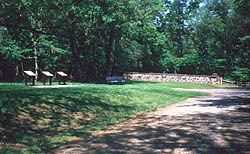 Ball's Bluff National Cemetery, one of the nation's smallest military cemeteries, was established in December 1865 as the burial place of 54 Union casualties of the battle.